A New York Appellate Division recently upheld and modified a jury award to the daughters of the victim of a bus accident, awarding $600,000 for the financial losses suffered by that family when their mother was killed. The case, titled Keenan v. Molloy, illustrates how wrongful death claims compensate the families of those killed in New York accidents. Virginia McKibbin was killed by a New York City Transit Authority bus while crossing the street on the night of December 2, 2009. Her three daughters brought a wrongful death claim on her behalf. The daughters described the close relationship that they had with their mother, the loss of financial support they would suffer from her passing, and the loss of the childcare services that the woman provided for her three grandchildren. Considering these factors, the jury awarded the family of Ms. McKibbin $1.2 million. Since the jury found that the woman had been 25% responsible for the accident which resulted in her death, and the bus driver 75% responsible, the award was reduced by 25% under the concept of comparative negligence that reduces personal injury awards by the amount that the plaintiff was responsible for the accident. The family members had also requested damages for pre-impact terror, but the jury declined to award them, and the family appealed the decision. 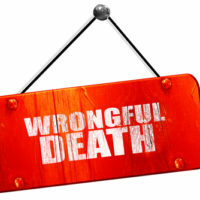 In New York, wrongful death lawsuits are more limited than that which is available in other states to the survivors of those wrongfully killed. Namely, while many other states allow survivors to recover for the emotional pain and suffering of suddenly losing a loved one, New York does not. Since this is the case, families of negligence victims are limited to recovering for the monetary loss they suffered as a result of their loved one’s death, including medical and funeral expenses, the loss of wages the deceased would be expected to use to support their family, the lost value of the services the loved one provided, and the loss of parental guidance and support. Additionally, many families seek to recover for the suffering experienced in the last few moments of their loved one’s life. It’s wrenching to consider, but New York allows for awards of compensation for the emotional distress experienced in the moments after a victim became aware that a very serious accident was about to occur. This is known as pre-impact terror. Courts will require some evidence that the victim had seen the threat to her safety, and knew that she would soon become seriously injured. For example, a victim of a head-on vehicle collision who spent several conscious seconds hurtling toward the other car would be a good candidate for damages for pre-impact terror, but someone struck from behind would not. In the case of Ms. McKibbin, the plaintiffs could not present conclusive evidence to the jury that the victim was aware she was about to be hit by a bus, and so they failed to succeed in a claim for pre-impact terror damages. The driver of the bus did testify that he heard a scream immediately before feeling the impact, but there was no evidence that it was the victim who screamed. The Appellate Division thus affirmed the jury’s decision not to award damages for pre-impact terror. If you have lost a loved one due to the reckless or negligent behavior of another person, contact the skilled Hudson Valley wrongful death attorneys at Rusk, Wadlin, Heppner & Martuscello for a consultation on your case, in Kingston at 845-331-4100, or Marlboro at 845-236-4411.